When we told friends and family we were heading to Antarctica, there were two questions we heard from just about everyone: “Can you bring me back a penguin?” and “What in the world do you pack for a trip like that?” We were sorry to disappoint everyone who asked for a penguin of their own; in addition to not being able to provide comfortable transportation for them on our epic journey from Ushuaia, Argentina back to Washington, DC, they all seemed very happy as productive members of their communities, and there was no reason to disturb them. Still, that was the easier question to answer. What we were going to put on our Antarctica packing list was a lot harder. If you have been thinking about visiting the southernmost continent, chances are you have been wondering what to put on your own Antarctica packing list. We’re hoping to take some of the guesswork out of what you should put in your own suitcase—and what you might want to leave at home. 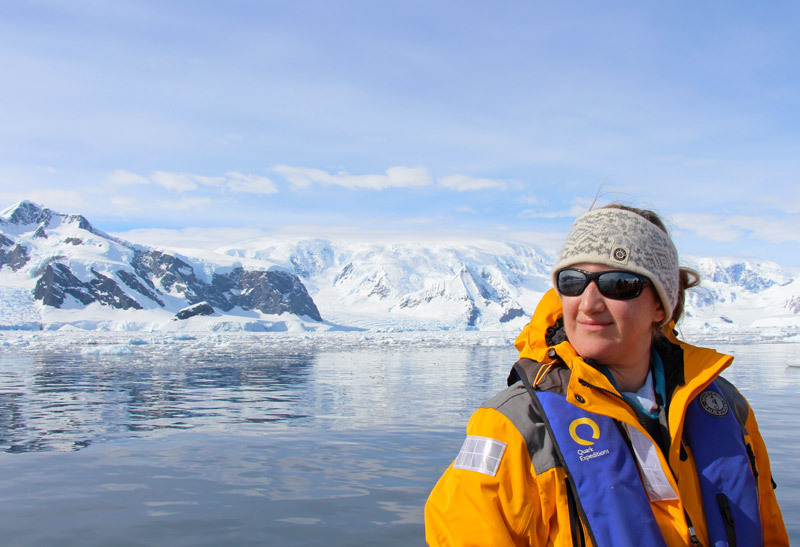 Here is what ended up on our Antarctica packing list: from essentials to optional items to what we learned from our experience, this is everything you’ll need for your trip to the ice! ► Underwear. This is an obvious item, but you may need more than you think. We found that we showered more often than usual while on the ship (usually first thing in the morning and again when returning to our room after an excursion, where it was common to either be freezing cold or a little sweaty depending on the conditions outside). Consider packing an extra pair of underwear for each day you expect to spend on the ice just in case! ► Socks. A few pairs of lightweight socks to wear when you are on the boat will go a long way toward keeping your feet toasty! You may want a pair per day if you will be wearing sneakers on the boat; if you are comfortable wearing them multiple times, won’t wear them every day, or plan to wash them you can get away with as few as three pairs. ► Pajamas. Take one or two pairs of pajamas with you. If you don’t mind sleeping in the same PJs every night you may find a single pair is just fine. ► Shirts. Pack a variety of sweaters, long-sleeved shirts, sweatshirts, and t-shirts for your cruise. We found our ship was warmer than we expected, so we were happy to have a few short-sleeved options to wear. I took three sweaters, three t-shirts, two long-sleeved shirts, and a hooded sweatshirt and wore everything two or three times. Adam took three sweaters, three t-shirts, and two sweatshirts and wore each of them multiple times as well. ► Pants. Depending on what is comfortable for you, bring jeans, leggings, cargo pants, or whatever you most enjoy wearing when relaxing. I lived in leggings since I spent my days on the boat wandering between the dining room, the lounge, and the lecture hall. Adam took two pairs of lightweight hiking pants that kept him comfortable during the day. ► Rubber soled shoes. Leave the flip flops at home; take a pair of sneakers, boots, or another type of closed-toe, sturdy shoes. The boat can unexpectedly tilt in rough seas, and you’ll want to be sure you have good shoes to help keep your balance. Adam wore sneakers every day, and I wore my favorite Ugg boots and occasionally a pair of Cole Haan ballet flats. ► Base layers. Base layers are absolutely essential. 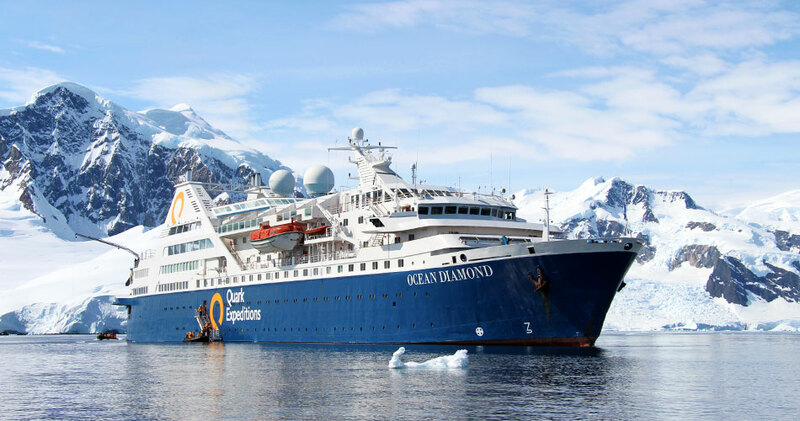 You’ll wear them every time you leave the cruise ship, which can be an hour or two on some days or up to nine hours if you plan to camp on the ice. Pack one or two pairs of base layers, which should be made of wool or synthetic fibers that will keep you warm and dry. Merino wool is a popular favorite. ► Insulating layers. Pack one or two fleece or wool jackets or sweaters to wear over your base layers. You can always add or remove layers depending on the conditions outside, but it’s important to have the layers available as an option. If the sweaters or jackets you packed to wear on the boat are made of insulating material, you can absolutely wear them off the boat as well—a great idea if you are tight on space! Waterproof pants will help you stay dry when you visit the penguins! ► Waterproof pants. There’s a difference between waterproof and water resistant, and you will need genuine waterproof pants to keep you dry when you cruise around on zodiacs and walk through the snow and ice. Be sure your pants are big enough to wear a layer or two underneath them on very cold days. I absolutely loved the pair I bought from LL Bean; I bought a size larger than I usually wear to be sure my base and insulating layers would fit when I put them on. If you are trying waterproof pants on at the store, consider taking your base and insulating layers with you to be sure you get the correct size! ► Wool socks. There is nothing worse than having cold feet, so bring 3-4 pairs of thick, warm socks. Merino wool is a great choice, and you may want to wear two pairs at once if your feet get really cold. Adam and I both took LL Bean boot socks, and they kept us warm without making our feet sweaty. ► Gloves. I took two different pairs of gloves: a thick, waterproof pair for zodiac cruising, and a thinner pair for walking around and when I wanted to use my phone or camera. I was glad to have them both, and I often took both pairs with me on excursions. LL Bean gloves are my favorite. ► Hats. Warm hats are key, and I took a wool hat and a wool headband to be sure my ears were always covered. On warmer days I only wore the headband, and on colder days I was glad to have the hat to layer on top. Adam and I both took the Icewear hats we bought in Iceland, and our heads were never cold. ► Scarf or buff. Don’t overlook your neck—a scarf or a buff will protect your neck from the wind, and you can pull it over the lower half of your face if the winds pick up. The zodiac rides can get especially windy! ► Sunscreen. Just because it’s cold doesn’t mean you can’t get a serious sunburn! Pack some sunscreen and apply it liberally each time you go outside. Choose one with a high SPF and reapply early and often. Several people on our cruise left with painful burns as unexpected souvenirs! A good pair of polarized sunglasses is essential. ► Sunglasses. Pack a pair of sunglasses with UVA/UVB protection. The sun is blinding when it bounces off the pristine white snow, and you will want to protect your eyes and avoid strain or snow blindness at all costs. ► Small backpack. Take a small, lightweight backpack or dry pack to keep your camera, phone, and other belongings safe when you leave the ship for excursions. You will need both hands free when you enter and exit zodiacs, so a backpack will ensure your personal items are secure without needing to hold them. ► Camera. If you have a nice camera, this is definitely a trip where you’ll regularly put it to good use! We took more than 2,000 pictures during our week and a half cruise! Don’t forget an extra battery or two as well as your charger so you don’t miss a single shot, and consider an extra memory card as well. ► Cell phone. You won’t be spending time online on this trip, but you’ll still want your cell phone accessible on the boat and during excursions. Some of the best photos we took were on our iPhones, and they were often the easiest to maneuver when a seal or whale popped into view. Again, remember your charger! ► Kindle or e-reader. You may have quite a bit of down time on the boat, so put an e-reader on your Antarctica packing list. I love my Kindle, which stores hundreds of books and makes it a lot easier to travel with my whole library (I often read multiple books in a week, and carrying so many in my luggage wasn’t feasible). Best of all, a Kindle battery often lasts for weeks at a time, so if you fully charge yours before you go you might be able to leave the cable at home (one less thing to get tangled in your suitcase!). ► iPad or laptop. 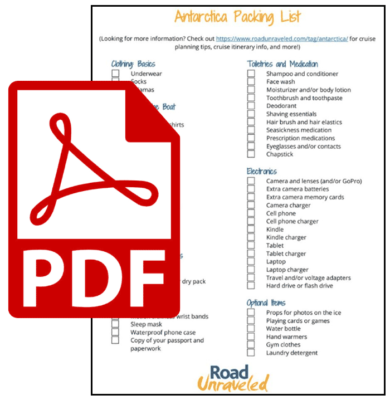 Your trip to Antarctica will go faster than you can imagine, so I relied on my iPad to jot down the notes and details that helped me document the experience. If you would prefer a lower-tech option a classic journal will be just as effective. Alternatively, if you take a laptop with you it can serve as a place to back up the hundreds of photos you will inevitably take. ► Travel adapters. Check with your cruise line before you depart to see if you will need a voltage or travel adapter for the ship. Our ship had European two-pin electric sockets, so we needed several adapters in our room to keep our electronics charging. Additionally, our ship had 220-volt electricity, which would have posed a challenge if we had electronics that couldn’t operate on that current. Many modern devices like cameras and cell phones are dual voltage, but conduct a quick inventory of the electronics you plan to take to be sure you identify anything that requires a voltage converter—and then pack one! ► Hard drive or flash drive. Especially important if you don’t take a laptop, pack a hard drive or flash drive to back up your photos. You will feel better knowing that your pictures are saved in multiple locations in case your phone or camera is damaged. We took the SanDisk iXpand Flash Drive for iPhone (128GB) to back up our iPhone photos, and the RAVPower FileHub Plus was a great tool for backing up our DSLR camera. ► Chapstick. Sure, you might be spending a week on a cruise to visit a continent made of snow and ice, but don’t underestimate how very dry Antarctica is! Pack chapstick to combat dry lips that will become chapped after exposure to the sun, wind, and dry air. ► Moisturizer or lotion. I took body lotion and a face moisturizer and was grateful for them every morning and afternoon when I applied them. Body lotion will soothe your dry skin, and a great face moisturizer with an added SPF will make a great foundation before you apply sunscreen. ► Seasickness medication. The Drake Passage is often called the Drake Shake for good reason! Consider how your body might react to rough seas and consult with your doctor to identify the best preventative medication for you. Whether you take a prescription, an over-the-counter medication like Dramamine, or ginger tablets, don’t forget to pack your remedy of choice! If you prefer not to take medicine you might be just fine (I was! ), and most ships will provide a limited selection of medications to distressed or anxious passengers. ► Shampoo and conditioner. Not everyone will elect to bring their own shampoo and conditioner, but if you are particular about your hair care this is one recommendation I would make. Ships will likely offer a combined conditioning shampoo, but I found it dried out my hair. Bring a couple of travel sized bottles of your favorite shampoo and conditioner to combat bad hair days! ► Face wash. Similarly, you won’t find face wash on the ship, so if your skin is sensitive you may want to bring a trusted brand of cleanser to wash the layers of sunscreen off at the end of the day. ► Bathing suit. Yes, take a bathing suit to Antarctica. Really. 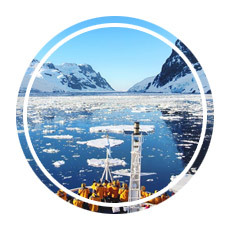 Many itineraries will include a chance to make a Polar Plunge into the Southern Ocean, and you won’t want to miss your opportunity to do it just because you forgot your swimsuit at home. Some people wore costumers or other fun outfits (you will get your picture taken! ), but at the very least a bathing suit will ensure the plunge is possible for you if you’re up to the challenge! ► Laundry bag. We always travel with a dedicated laundry bag to keep dirty clothes separate from clean ones, and on a long trip like an Antarctica cruise you might find this to be a particularly useful item. Plastic grocery bags work well, but we have upgraded to a larger reusable bag that holds much more than a single shopping bag. The views in Antarctica are incredible. ► Motion sickness wrist bands. If you are worried about seasickness a simple pair of motion sickness wristbands might make you feel a bit better. Using acupressure, the wrist bands have a small plastic knob that presses into the Nei-Kuan pressure point on your wrist. We liked Sea Bands, which are clinically tested. They are not guaranteed to work for everyone, but we both thought they made a difference. ► Sleep mask. 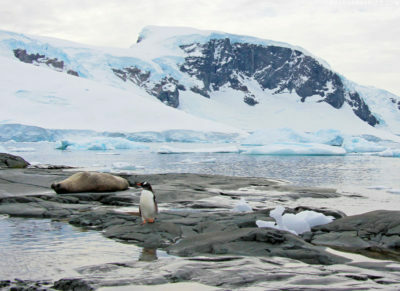 Your Antarctica cruise will occur during the southern hemisphere’s summer, and the sun may not set while you are there. If you are sensitive to light when you sleep, a sleep mask will keep the sunlight out and give you a better chance of getting some rest. 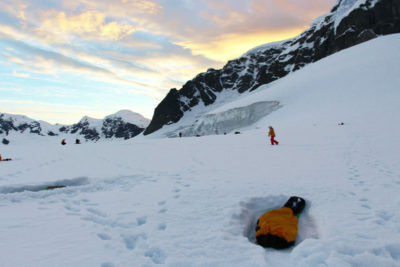 If you are planning to camp on the ice we highly recommend a sleep mask for that evening! ► Waterproof phone cases. There is a great possibility that your phone might get wet when you are jumping in and out of zodiacs and spending time cruising around the continent, so invest in a waterproof phone case to protect yourself against accidents. We opted out of standard cases and instead picked up a couple of mini dry bags that were the perfect size for cell phones. Because the cases were clear we were also able to take photos while the phones were safely inside of them, and since they included lanyards we could secure them around our necks so we didn’t accidentally drop them into the water. ► Copy of your passport and paperwork. Unbeknownst to us, when we boarded our cruise ship we had to surrender our passport for the duration of our experience; Argentina requires the cruise operator to hold passports for all passengers on board. Take a photocopy of your passport in your luggage just in case you need it. Additionally, take a paper copy of your flight itinerary, cruise confirmation, and travel insurance just in case you need to review them during a point in your journey where the internet is not available. ► Props. Many people on our cruise took country flags, toys, and signs that they wanted photographed on the ice, so if you have a special picture in mind take a prop or two. 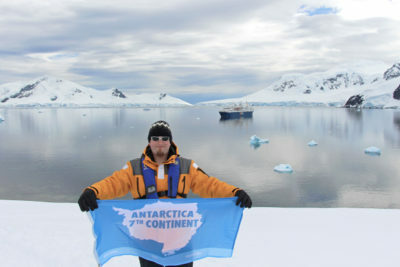 We ended up buying an Antarctica flag on our Quark Expeditions boat, but we also took a dry erase board to write messages on. ► Playing cards or games. 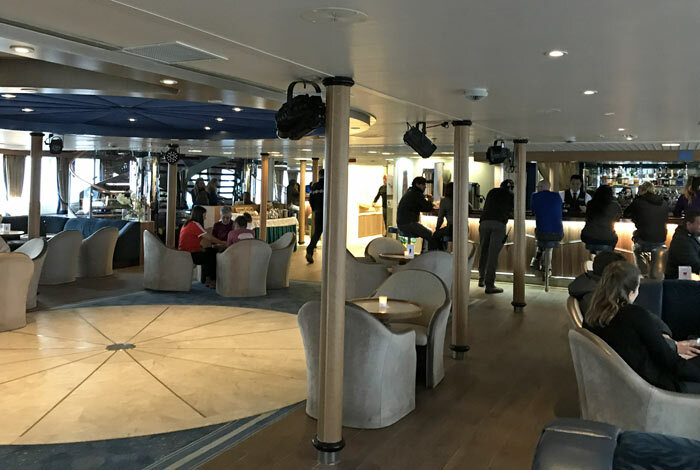 We saw many people playing cards and games during our at sea days and in between excursions to the ice, so you might find a few lightweight entertainment options to be a great addition to your Antarctica packing list. As an added bonus, asking fellow passengers if they want to play with you can be a great way to make friends! 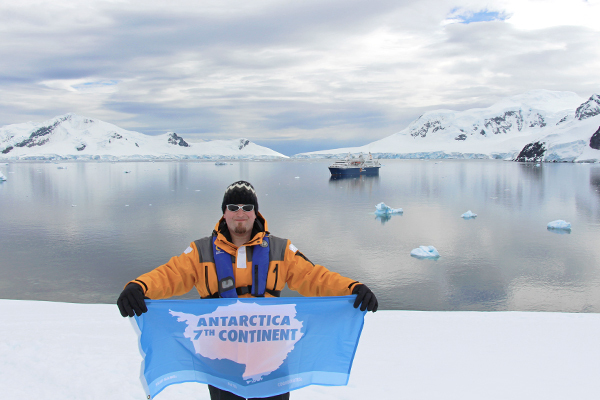 Bring a flag to celebrate your landing in Antarctica! ► Water bottle. We received a complimentary water bottle during our cruise, but it wouldn’t hurt to pack your own if you have the space available. We make hydration a priority when we travel, so carry a water bottle with you everywhere you go. ► Hand warmers. A few pairs of inexpensive hand warmers can go a long way toward keeping you nice and toasty on the ice! We were glad to have them when we went camping, but hand warmers like HotHands serve a dual purpose by keeping your phone and camera battery warm as well. Cold weather can wreak havoc on battery life, so having a hand warmer available to keep them from getting too cold is a great tool to carry with you when you’re in a zodiac or walking around the continent. ► Gym clothes. Some ships have gyms, and although you’ll get plenty of exercise through hiking and walking you may want to bring workout gear if you know you’ll make use of the facilities. Don’t waste the space in your luggage if you don’t think you will work out, though; you really will burn plenty of calories as part of your daily itinerary. ► Laundry detergent. You may be able to wash some of your clothes in your cabin on the ship, and if you want to reduce the amount of clothing you pack some laundry detergent will set you up to turn your sink into a washing machine. Most ships will offer laundry service, but it’s often very expensive. ► Parka. Don’t invest in a warm, bulky parka; almost every cruise will issue you a brand-new parka to wear, and you’ll get to bring it home with you as a souvenir. The parkas provided by cruise operators are warm and waterproof, and even if you have one of your own you will still be required to wear the parka issued to you. ► Boots. Your cruise will likely provide you with a pair of waterproof boots, so save the luggage space and don’t bring a pair of your own. The boots provided will be more than sufficient to keep your feet dry. ► Open toed shoes. Because you can’t wear them on the boat or off the boat, leave the flip flops and other open toed shoes at home. ► Leave room for your parka. The parka you receive will be bulky and heavy—and it’s yours to keep. Allocate some space and weight to pack it in your checked luggage on the way home. Although most people carried them off the boat and onto planes, everyone wished they had one less thing to carry. That said, you won’t want to leave it behind; it’s a very cool souvenir to have! 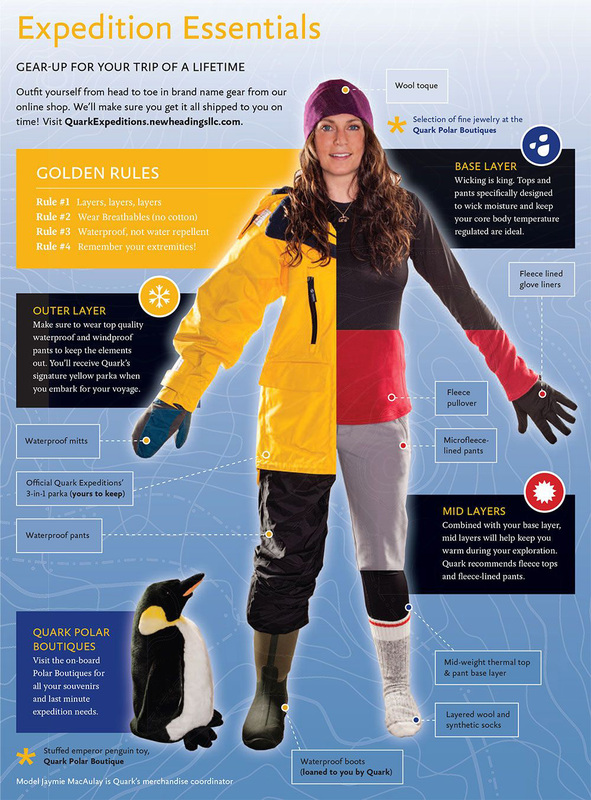 We loved this infographic from Quark Expeditions. 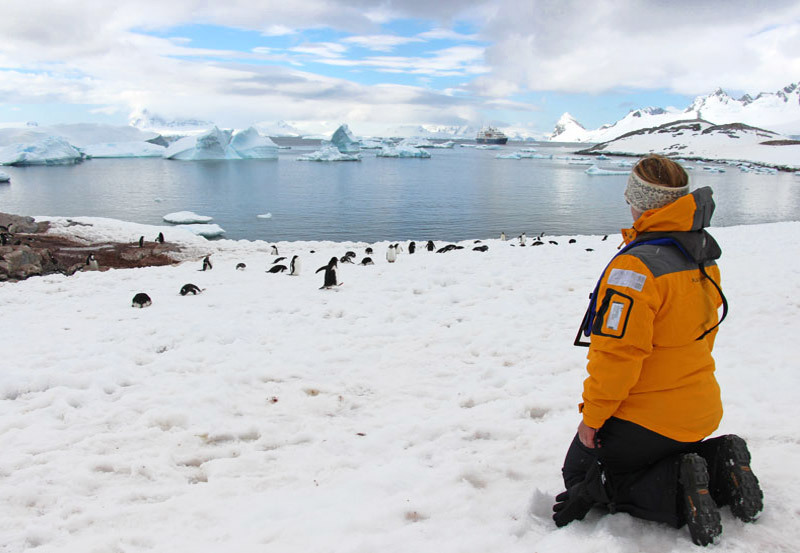 It showcases some of the essential items you’ll need for an Antarctica trip. 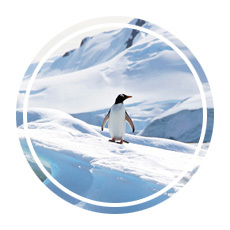 Quark’s Online Boutique is also a great place to find Antarctica gifts. ► Take a suitcase that locks. For extra security on the boat, we were happy to have a suitcase with a built-in lock to secure our important documents and electronics. The safe provided wasn’t large enough to fit a laptop, so it was great to have an extra layer of security when we were out of our cabin. ► Consider other stops on your itinerary when finalizing your packing list. 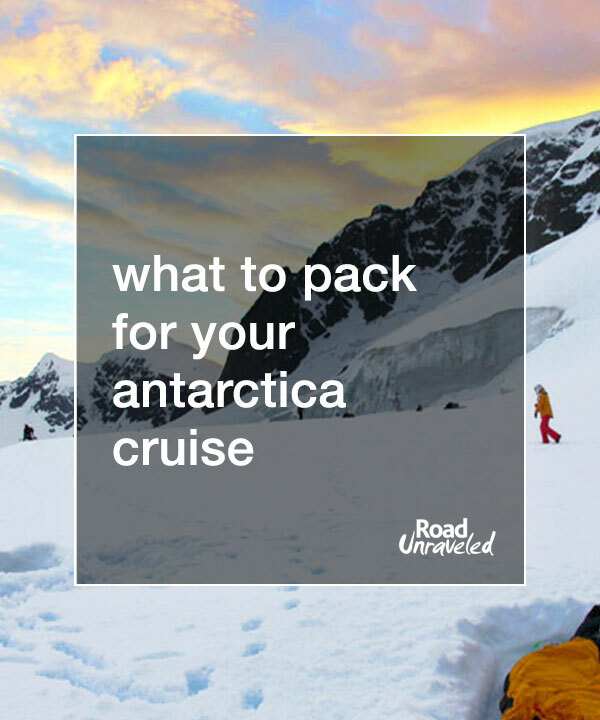 Although this list covers just about everything you would want to have on your Antarctica cruise, if your journey will include time in other cities like Buenos Aires, you’ll need to pack clothing appropriate for those locations. Most of South America will enjoy a warm summer during your visit, so save some space for t-shirts, shorts, or other warm weather clothing in addition to your Antarctica wardrobe. 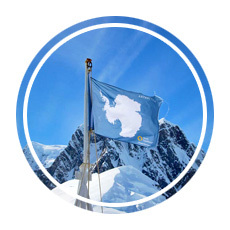 ► Antarctica isn’t necessarily a fashion show. I saved a lot of space by packing comfortable clothing, re-wearing most items, and leaving makeup and jewelry at home. You may feel differently, but by the time our boat was out to sea most of the passengers were exclusively wearing loungewear. Don’t worry about dressing to impress: your fellow passengers won’t care, and the penguins and seals definitely won’t notice your wardrobe! ► Keep warm clothes available at all times. When you are settled into your cabin, keep your parka, gloves, hat, and boots at the ready. We were called outside at all hours of the day and night for whale watching, bird sightings, and even to marvel at the mountains and ice formations we were passing. 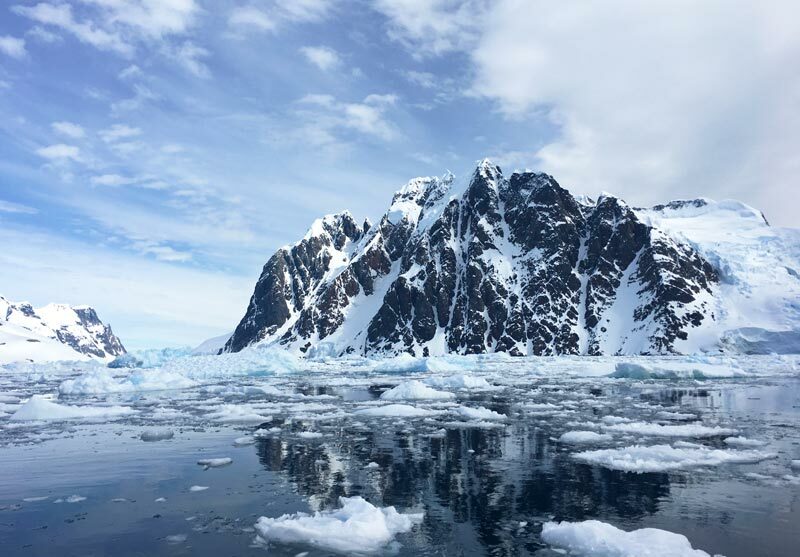 If you have your warm layers out and ready to put on you won’t miss a moment of the spectacular show you are going to be part of during your Antarctica cruise! 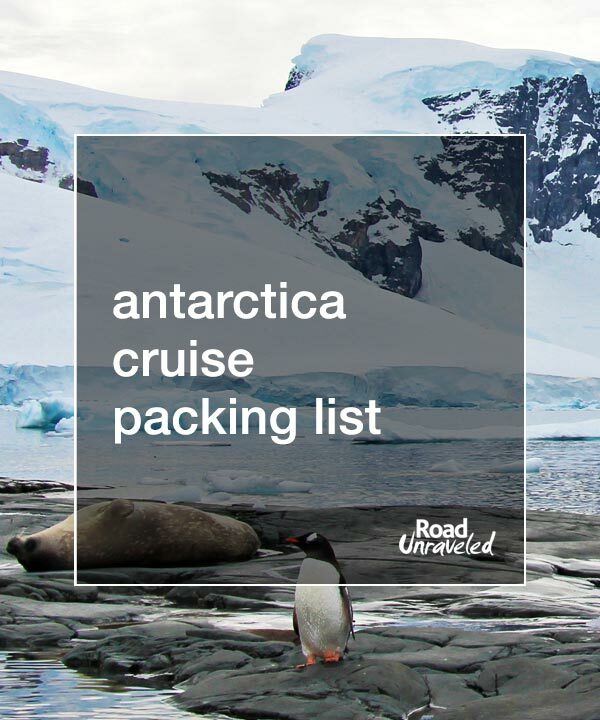 Putting together your Antarctica packing list might seem like a daunting task, but if you are organized and put some thought into the experiences you plan to have on and off the ship it will be much easier to be sure you don’t forget a thing. To make things even easier for you, we have created a printable PDF checklist to help you ensure everything you need makes it into your suitcase! We would love to hear from you if you find this list useful when packing for your own journey to the ice! 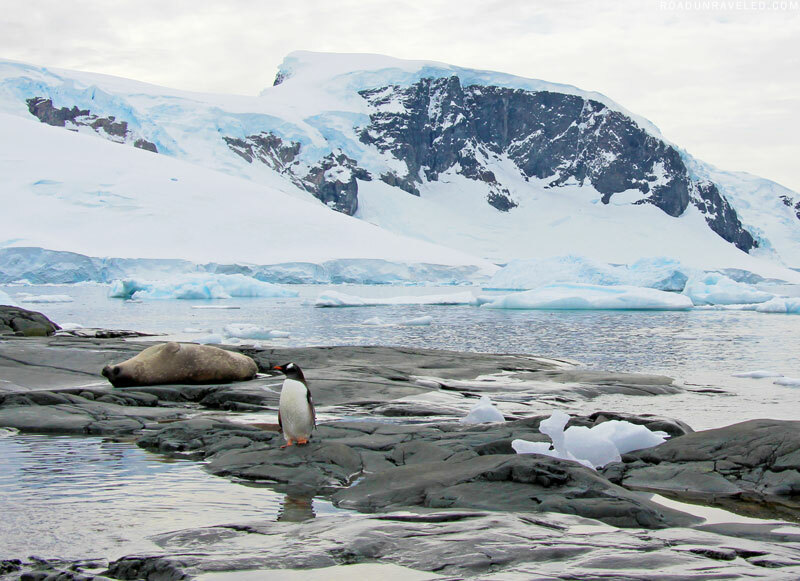 If you are getting ready for an Antarctica cruise, here are a few articles to help inspire you!